Things have been just a little busy around here lately. Actually, that’s an understatement. It’s been downright hectic. I’m sure our situation is far from unique. Preparing food for Christmas isn’t for the fainthearted. You’ve gotta have a pretty strong constitution to get through the festive period. The will to keep going when you just.cant.de-bone.another.chicken, or roll out more fruit mince pie pastry, or ice another spice biscuit. The guts to brave the zoo that is small town supermarkets on a Sunday (pretty much the one and only time they’re open on Sunday all year) and to deftly manoeuvre your cart around the other half-crazed, half-desperate shoppers. To have enough sense of dignity to not break-down sobbing in the cheese section because 150g of goat’s cheese is close to an hours wage. And you need more than one packet. It’s a good thing Christmas only comes around once a year. As I’ve revealed previously here our family isn’t even that big on Christmas. Our only festive decoration – the tree – went up yesterday afternoon and it’s adorned almost solely with ornaments made out of pop-sticks and egg cartons. Consequently my preparation for Christmas dinner would appear piddly compared with many others. What hasn’t helped, however, is that our belongings from Sydney rocked up on Saturday morning, resulting in a frenetic bout of unpacking and throwing out to ensure that the house was liveable again, or at least moderately tidy for ‘the big day’. When you’re up to your ears with things to do, it’s nice to have a few quick treat recipes up your sleeve. Ones to fall back on when you realise you’ve forgotten to buy a present for your second cousin’s girlfriend, or someone drops around unexpected, or when a sugar hit is pretty much vital to keeping you going (or so you convince yourself). Now I could give you a nice healthy treat recipe. And with all the other indulging going on it probably would have been a good idea. But you know what? Sometimes circumstances call for a little more splurging and if you’ve been slaving away in the kitchen for days on end you deserve a pick-me-up. We’re going to turn to a no-bake classic. Rocky road. The novelty of snipping the marshmallows with scissors (it’ll make your life a lot easier, trust me) alone should perk you up. There’s glace cherries and shortbread for that Christmas touch and toasted coconut and almonds for a smidge of nutty flair. You’re going to melty, melt, melt the dark chocolate nice and slowly in the microwave (or over a bain marie if you can be bothered and actually have pots and pans available) then pour it over all your ‘mix-ins’. Fold the chocolate in so everything is nicely coated and tip into a lined loaf tin. Smush it in with a spatula (gently – or is that a contradiction?) so it’s well-packed. Now melt a tad more chocolate for smoothing over the top. The result? A somewhat smoother top and not one but two bowls to lick. Consider it as my Christmas present from me to you. The tin then goes in the fridge – useful when you’ve got a million other things fighting for oven space. On seconds thoughts you’re fridge might be bursting at the seams too. Go on, shove it in somewhere. There’s always room for chocolate. Half an hour later you’ve got one big solid block of bliss. 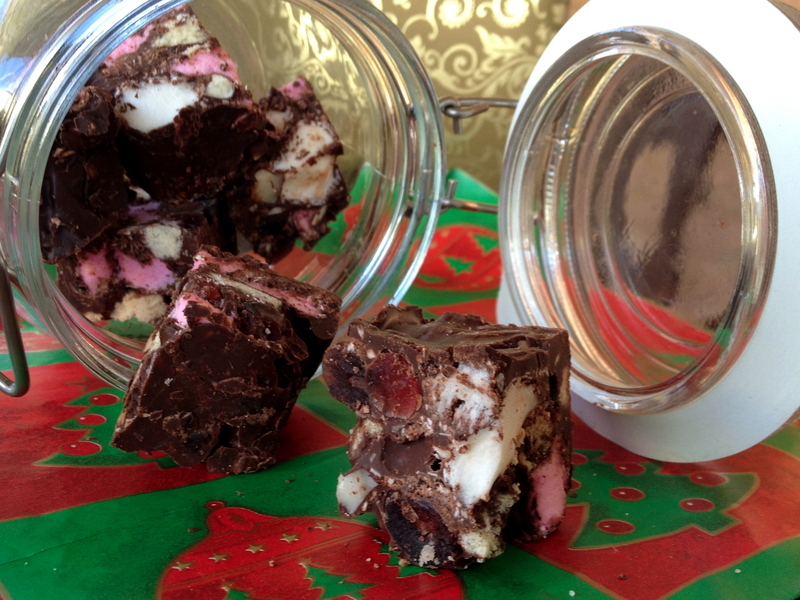 Cut it into your preferred size with a hot knife (dip in hot water after every cut for even edges) and hey presto, rocky road is done. Now the slices may be a little on the rustic side (or maybe my cutting skills aren’t up to scratch) but Christmas is an oldish tradition right? So there’s nothing wrong with a bit of rustic-ness. You did it on purpose, of course. For those of you who live in Aus (packet sizes might be different elsewhere), I’ve created the recipe so you have half a bag of marshmallows left over, and about 100g of dark chocolate from a standard packet of melts. I don’t know about you, but the extras will come in handy for hot-chocolates and other emergency sweet situations. Alternatively, make a double batch. I doubt you’ll have trouble giving it away/finishing it off! Makes approximately 20 1inch square pieces. Grease and line an 11cm by 21cm loaf tin with baking paper. Place 200g of the chocolate in a bowl and either melt in the microwave according to packet directions or melt gently over a pot of simmering water until smooth. Set chocolate aside to cool slightly for 5 minutes. Meanwhile, toast the shredded coconut and almonds in a small frying pan over a low heat, stirring regularly, for about 2-3 minutes or until just golden brown and fragrant. Combine the toasted nuts with the marshmallows, cherries and shortbread in a large bowl. Pour the melted chocolate over the top and stir gently with a rubber spatula or large metal spoon until each ‘piece’ is coated in chocolate. Scrape the mixture into your prepared loaf tin and press gently to ensure that there are no gaps where air bubbles can form. Melt the remaining chocolate in the same manner as you did before and then drizzle over the slice. Spread with a spatula to form an even top and fill in any gaps. Refrigerate for at least 30 minutes or until firm. Cut into pieces (the size is up to you!) using a large sharp knife, dipping it in hot water after every cut. Will keep in an airtight container in a cool, dark place for up to a week. Source: A Taste Without Waste original. It adds a super yummy touch…I urge you to give it a try at some point!The same to you Julie. I hope you have a lovely day.